Adam Goodes is a victim of racism. It really is that simple. People might boo him for other reasons but there are people who are booing him because he’s Aboriginal. You know what that is? Flat out racism. There’s no two ways about it. I’ve seen it first hand. At the North Melbourne V Sydney clash in the middle of June, I was observing what was going on around me at half time when the two men in front of me started discussing Goodes. Before long they began talking about booing him (which they were doing) when one said to the other one “I boo him because he takes being Aboriginal too far”, with the second man wasn’t shy in agreement. “He takes being Aboriginal too far”. Let that sink in. Grown men threatened because somebody is proud of who they are. Australia is a racist country, let’s not pretend that we aren’t. Immigrants have always caused “problems” and it wasn’t until the referendum of 1967 that we recognised Aboriginal people as citizens of this country. If those two things aren’t racist then I have no idea what is. How does he take it too far? By talking about issues faces his community every day? By questioning why the support isn’t there? By telling us that children from Aboriginal backgrounds are at higher risk of negative life outcomes? Those things are all true. Is it the fact he referred to Australia Day as “Invasion Day”? Again, if you ask an Aboriginal person (if you can be bothered speaking with one) you’ll find that he isn’t alone in giving it that moniker, because for many Aboriginals that’s what it is – white people celebrating their invasion of Australia. “Oh but not all Aboriginal / other race players are booed”. Obviously, but that doesn’t mean Goodes is alone. Lin Jong and Majak Daw have both been racially vilified in the past, yet society seems to understand that isn’t okay, but heaven forbid we give the same treatment to an outspoken Aboriginal activist. People are afraid of what they don’t understand. 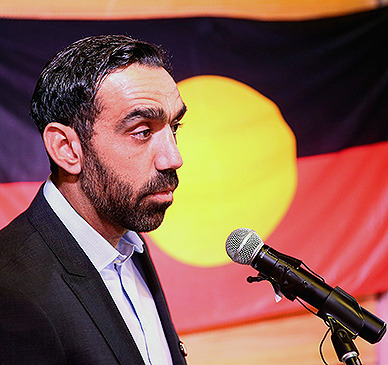 Those who are carrying out the racist acts are afraid of Adam Goodes because they don’t understand how somebody who they perceive as being a lesser being could be allowed such airtime. Airtime that we’re happy to give to the likes of Alan Jones who reinforced the misguided perception he does nothing but play the victim card. Or the talk back caller I heard who decided to tell the world they believe that Goodes “abuses his position of power”. Abuse? No, it’s called making use of a platform you’ve been given and doing it for the greater good. If you think Goodes does it because he’s trying to advance his own career then you have another thing coming. Goodes fights the fight in spite of the people who can’t handle what he does. If you’re going to boo Goodes in future I hope you’re prepared to be tarred with the same brush. This entry was posted in Published on xavierplayer.com, Written and tagged Adam Goodes. Bookmark the permalink.